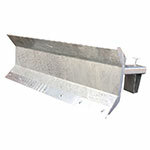 Optional rubber blade insert to protect the edge of the plough. Although potentially a seasonal attachment, the fork mounted snow plough is invaluable when the clearing of freshly fallen or compacted snow is required to ease vehicle or pedestrian access i.e. car parks, access roads and service yards. Clearing snow is obviously a seasonal event for most, but it is essential. How many times has the door or driveway to the workshop, factory or warehouse been blocked by snow? And how many times has getting the snow shovelled away or ploughed offsite prevented deliveries in a timely manner? With this snow plough forklift attachment, snow will no longer hold businesses hostage. The days of having to purchase a specialist snow ploughing vehicle are gone. Ordinary forklifts, which are used every day, can be quickly converted into snow removal machines in next to no time. It is simply a matter of mounting the snow plough attachment onto the forks and starting to clear freshly fallen or compacted snow almost immediately. Manufactured using only the highest quality materials for longevity and durability, this snow plough forklift attachment does not have to be limited to only the winter months. It can also be used as an effective yard scraper all year long. The snow plough forklift attachment comes in several blade widths for ultimate versatility; 1,250mm, 1,500mm and 1,800mm. Each blade fits a standard forklift with a maximum fork range of 150mm x 50mm and fork centres of 683mm. 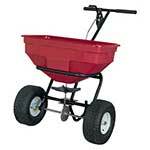 This piece of equipment is ideal for busy loading docks, factories, warehouses and parking areas.